Hobbies: Anisha loves Bollywood dancing and trying teas from different countries around the world. Fun Fact: She never drinks cold water- only hot water with lemon (even in summer!). Bio: Anisha is a second generation Sri Lankan American born in Los Angeles. She fell in love with Bollywood and competed extensively while attending the University of Southern California with the Bollywood team USC Zeher and won multiple awards for Best Female Performer - including Miss Bollywood America in 2013 and 2014. While at USC, she obtained a Bachelor’s degree in Neuroscience as a pre-dental student. After graduating from USC, she toured with a professional Bollywood dance troupe Mystic India - traveling alongside many world-renowned dancers and performed in India, Australia, Hong Kong, Singapore, Trinidad & Tobago, Dubai, Canada and North America. In 2015, she started a four year dental postgraduate program to obtain her Doctor of Dental Surgery degree and delved into the world of pro dance by becoming a professional NFL cheerleader for the San Francisco 49ers. She’s so excited to be a part of the Golden State Warriors this year and share her passion for dance with all of Dub Nation! Hobbies: Bri loves engaging with her community. She has a love for learning, traveling and spending hours in museums. Fun Fact: Bri is a travel and adventure junkie having skydived, bungee jumped, zip-lined, and even flown on a microlight aircraft over one of the greatest wonders of the world, Victoria Falls in Africa. Bio: Bri grew up in the East Bay and was a gymnast for 7 years. 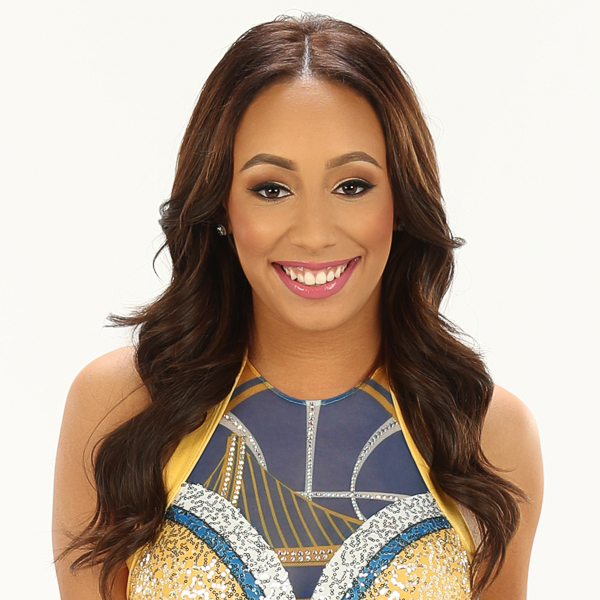 She later began cheering and dance training in hopes of pursuing her dream of becoming a Golden State Warriors Dancer. She loves being surrounded by her teammates and coaches because they empower one another to work hard, on and off the court. The best feeling in the world is when you get to do what you love, with the people you love, for the team you love. Currently she is a full-time student graduating this Spring with a BA in Sociology and plans to pursue her Master’s degree. Hobbies: Bridget enjoys spending her free time with family and friends. During her free time she loves spending with her family and friends. She also loves traveling, being outdoors, trying new restaurants, or just relaxing with a good movie and popcorn. Fun Fact: After a lifetime of trying she still can not whistle. Bio: Bridget grew up in the Bay Area with a passion for dance which continued as she performed on both her high school and college dance teams. She has always had the "travel bug" and moved to Madrid, Spain after graduating from the University of San Diego to further her studies in the language and culture. Currently, Bridget works in Web Content & Production for a local tech company focused on the Real Estate space. Hobbies: Brijet’s family is the most important part of her life, so in her free time she enjoys making memories with them. Whether it’s hiking the mountains of Yosemite Valley, or exploring the Islands of Hawaii and Fiji, they love to experience new places together. Fun Fact: She is a former championship fighter in Goju-Ryu Karate-Do and she is a licensed investment professional with her Series 6, 63 and 26 licenses. Bio: Brijet inherited her love of dance from her father, who was a skilled break dancer. She began training in all styles at the age of 5. She was also a scholar, graduating from the International Baccalaureate Program in the top of her class. She is a member of the Alpha Kappa Alpha Sorority, Inc. In her graduate chapter she serves as co-chair of the Economic Legacy Committee; leading the charge to bring financial education to Bay Area Communities. Brijet owns and operates a financial services business and for the past decade has educated and equipped her clients to become financially independent. Brijet’s love for dance has always given her a creative outlet, leading her to the pro-cheer stage where she danced in the NFL for both for the Oakland Raiders Raiderettes and the San Francisco 49ers Gold Rush. 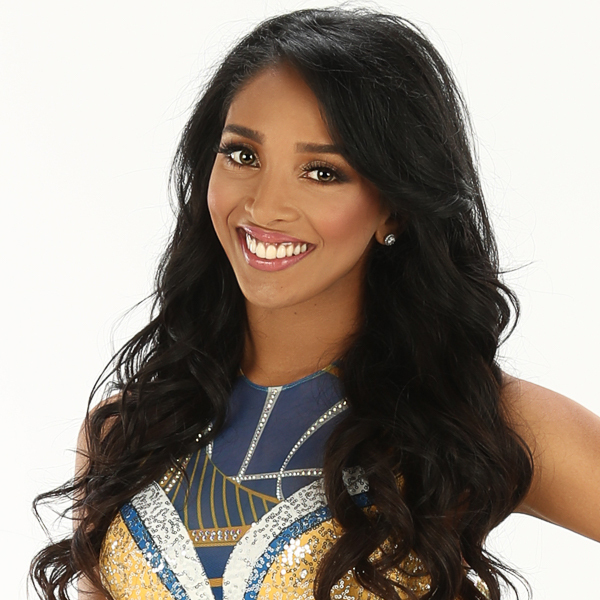 She is excited to now bring her Bay Area experience full circle in her first season on the Golden State Warriors Dance Team. Hobbies: Cassie loves being creative and is a serial DIY’er! Fun Fact: She can not parallel park to save her life. Quote: "Darkness cannot drive out darkness; only light can do that. Hate cannot drive out hate; only love can do that." -Martin Luther King, Jr.
Bio: Cassie grew up in Clayton, California where she found her passion performing through pop-warner cheerleading. Cassie always wanted to dance professionally but knew she needed technique and studio training to audition. She didn't start training in dance until after high school. Without a solid dance background like many other professional dancers, she knew she needed to work hard to accomplish her goals. In 2012 Cassie made the Raiderettes and continued to cheer for the Raiders for 5 seasons where she was a Captain and selected Raiderette of the Year and Pro Bowl Cheerleader. After a 2 year break Cassie is so excited to be in the arena dancing for the Golden State Warriors. Away from dancing Cassie is an entrepeneur creating custom art pieces for special events. Hobbies: Enjoys spending time with friends, going to the movies, & planning her next trip abroad! Bio: Hannah was born & raised in Irvine, CA where she started dancing at the age of 3, training in ballet, tap, jazz, contemporary, acro, & her favorite style - hip hop. She performed on dance teams in both high school & college. In addition to dance, during her time at UCSB she was a member of the Alpha Chi Omega sorority. After graduating with a BA in Communication, she moved up to the Bay Area and is currently an Executive Assistant for the CEO at a local tech company. Hannah's favorite part about being on WDT is the community events because she gets to interact with Dub Nation - the best fan base in the NBA! Hobbies: Hannie enjoys hiking, photography, concerts and learning different programming languages/technologies. Fun Fact: She went on a service trip to the Dominican Republic and provided medical help to 10 underprivileged communities and over 200 patients. Bio: Hannie began her dancing journey at the age of 7 when her mom dragged her to a dance class where she ultiamately fell in love training in jazz, lyrical, ballet, and pointe. Hannie continued her dancing journey at UC Berkeley where she led a contemporary dance company and also was a member of the Cal Dance Team her senior year. Upon graduation, she joined the Warriors Dance Team and is incredibly humbled to be part of an amazing organization that encourages growth both on and off the court. Hannie is also a software engineer at a health tech company that focuses on providing support to working parents. Previously she was a premed student; however, in her journey of becoming a doctor, she's discovered how inaccessible healthcare is and how the confusion of navigating through the healthcare system is prevalent. Hannie is passionate about creating technology that eases this problem and is currently building a mobile app that connects, guides and provides personalized resources to each patient. Bio: Hayley grew up in Bakersfield, CA where she started dancing at the age of three and was trained in tap, ballet, jazz, contemporary, and hip hop. After high school she attended Fresno State where she was on the dance team for four years. This is her first year on the GSW Dance Team and is honored to dance alongside her teammates and share her love for dance on the court. She is currently a full-time student studying Enology. Hobbies: Helen spends her free time staying active in the gym to outdoor hiking and everything inbetween - which is good because she also enjoys baking. Fun Fact: In college she got her motorcycle license. Bio: Helen was born in the Silicon Valley and began her dancing journey at the age of three. She competed in dance competitions starting at age nine until graduating from high school. She attended UCLA where she graduated in three years soon to return back to the Bay Area to cheer for the 49ers Gold Rush for two season. She now continues her love for performing with the Warriors as co-captain of the Dance Team. 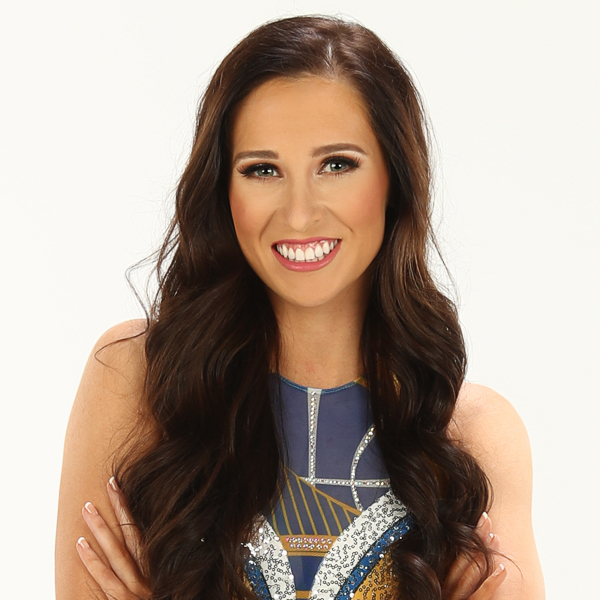 Outside of the Warriors organization, Helen is a personal & group fitness instructor and a personal stylist. Hobbies: She loves to spend her free time outdoors, traveling the world, learning about history, and immersing herself into different cultures. Currently, she is trying to teach herself to speak Spanish. Fun Fact: She was captain of her baton twirling team when she was 10 winning nationals and got invited to perform on Good Morning America and The Ellen Degeneres Show. Bio: Jasmine grew up in San Jose, California and began dance training in jazz, lyrical, contemporary, character/broadway, ballet, & hip hop at the age of eight. Her favorite baton memory growing up was performing and being featured as the solo twirler in countless parades all around the city. She was also part of her middle school, high school, and collegiate dance team; performing at football games, basketball games, and competing against other teams at the USA and UDA Nationals. She’s excited and ready to share her passion for dance and performance with her fellow teammates for the last year at Oracle Arena. Go Dubs! Hobbies: She loves traveling, working out with friends and voluenteering. Fun Fact: She was an extra in a few movies and TV shows such as Law & Order, King of Queens, and Stuart Little. Bio: Katerina was born in Estonia and moved to New Jersey when she was 8 years old. She participated in competitive gymnastics up until high school and then started dance. She’s trained in ballet, pointe, jazz, modern, and hip hop. She went on to cheer for the New York Jets for 4 seasons until she decided to drive cross country and move to California. She’s been dancing with the Warriors for 3 seasons since she made the move to the Bay Area and am excited for the new adventures ahead! When she’s not dancing for the best fans in the NBA she works as a Design Team Coordinator at an online hospitality global company. Hobbies: In her free time Katie loves exercising, exploring the outdoors, watching new movies, attending concerts and traveling. Fun Fact: At the age of 8 she was in the Broadway National Tour of Evita. Bio: Katie grew up in the Bay Area and began dance training in tap, jazz, contemporary, ballet, & hip hop at the age of five. She danced competitively through high school before dedicating her time in college to making an impact in her sorority, Alpha Phi, where she was the Director of Campus Activities for all four years. After graduating college, she moved back to San Francisco and was the 150th employee at an on-demand delivery technology company where she still works today as a Lead Business Recruiter. She continued to pursue her passion for dance by becoming a hip-hop fitness instructor at Uforia Studios. 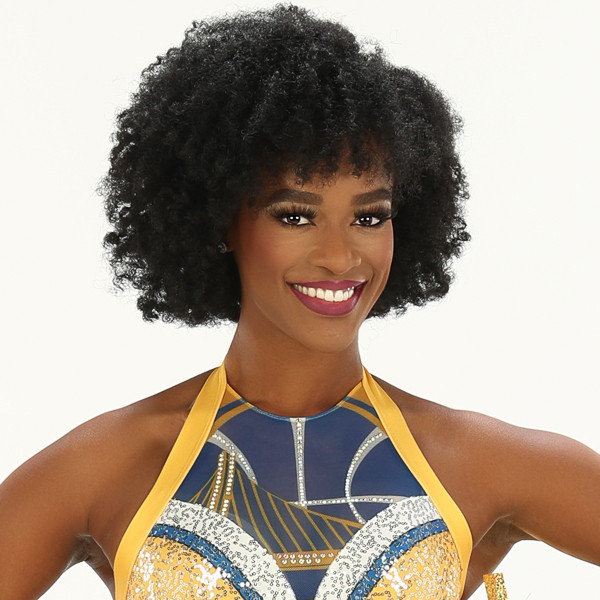 Auditioning for the Warriors has always been a dream of hers and she is thrilled to share her love for dance on the court with her teammates for her first season. Hobbies: Kristy enjoys morning cycle classes, playing tennis and taking her two little dogs to the park. Fun Fact: She love listening to classical music and walking around museums. Bio: Kristy grew up in Texas and started dancing when she was only three as she danced her way through college. She then graduated with a degree in Marketing and after several years in Human Resources made the career change to Medical Sales. Kristy also cheered for the Houston Texans for 2 seasons and then moved to California. To date being on the Warriors Dance Team has truly been her greatest adventure! Hobbies: Lauren enjoys scuba diving and recently went diving in Australia. She also enjoys cooking with friends and being outdoors as much as possible. Fun Fact: She has lived in seven different states and loves exploring new cities. Bio: Lauren has been dancing since the age of three in a variety of styles; tap, jazz, modern, ballet and hip hop. She attended the University of Notre Dame, where she danced with the Notre Dame Pom Squad at football pep rallies and basketball games. After graduating, Lauren started working full time in the consumer packaged goods industry managing natural and organic food brands who support regenerative agriculture practices. Lauren missed dancing and decided to dedicate her free time to training so she could audition to be on the Warriors Dance Team! She is thrilled to be apart of a World Class organization performing in front of an amazing fan base. Hobbies: Lizzy loves staying active whether inside a yoga studio or outside on a run. She also loves spending time with family and friends, reading, and exploring new places. Fun Fact: She rises with the sun! Lizzy loves waking up early so she can sit down with a cup of tea and journal before she starts everyday. Bio: Lizzy grew up in Danville, California and began dancing at 5 years old. 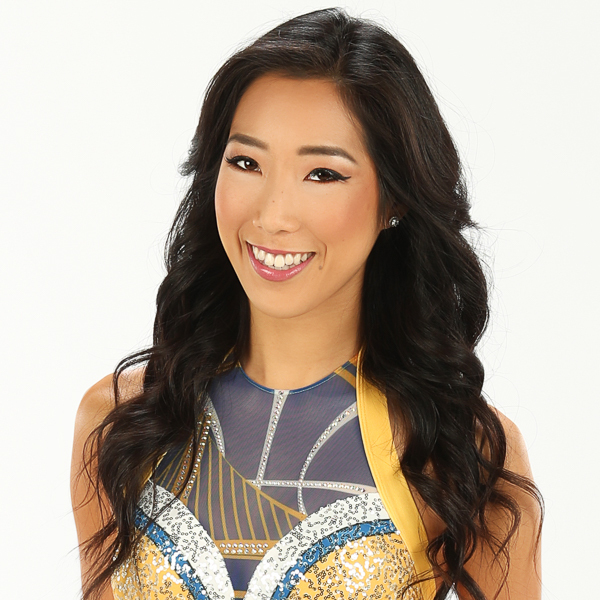 Before joining the Golden State Warriors Dance Team, she was part of the Cal Dance Team during her time at UC Berkeley. She is so grateful to continue her dance journey and for the opportunity to dance alongside such amazing teammates. She can't wait to show what this squad can do on and off court! Off the court Lizzy is pursuing a post graduate Doctorate Degree (PhD). Hobbies: Since she is new to the Bay Area, Maddie loves to explore new places for hiking, eating and experiences. Fun Fact: She loves to train in gymnastics, and you can often find her tumbling in our routines on the court! Bio: Maddie was born and raised in Mesa, Arizona and started training in dance and gymnastics at the age of three. 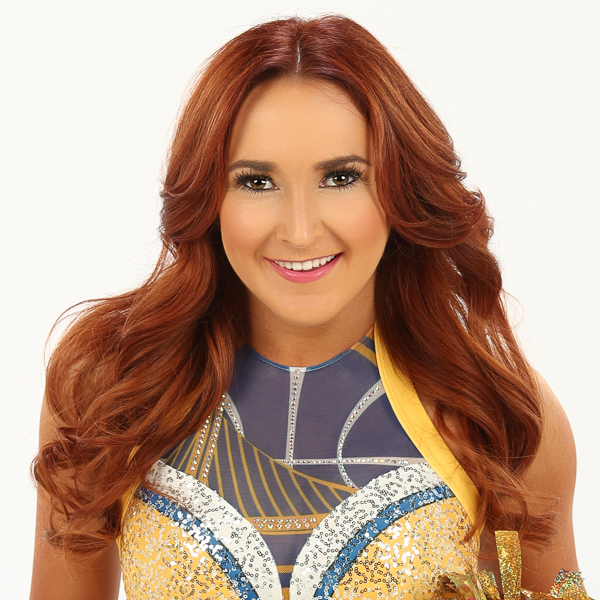 After graduating from Arizona State University and dancing for the Phoenix Suns, she decided to continue her dance career and moved to the Bay Area to dance for the Warriors. 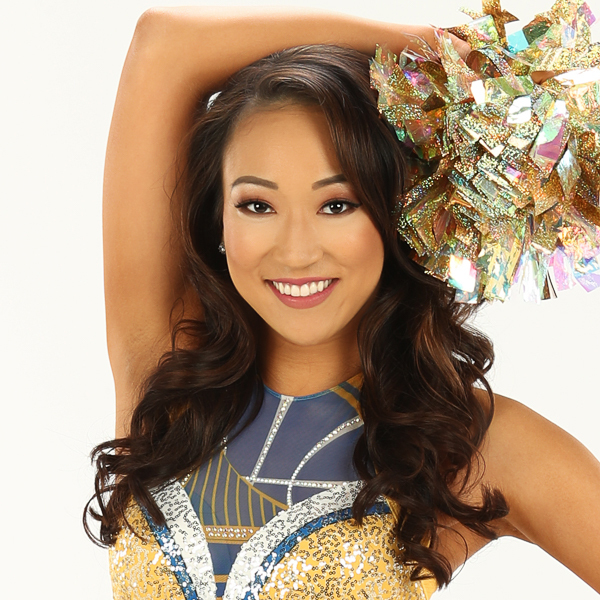 This is her second year on the team and she loves being out on the court and feeling the energy of the fans in Oracle Arena while dancing with her fellow teammates! When she is not dancing at Oracle she works as a fashion stylist. Fun Fact: Shes been dancing for 25 years and was on USA cheer staff for 5 years. Bio: Megan was born and raised in Glendale, Arizona where she started dancing when she was 2. She’s trained in hip hop, jazz, ballet and tap. She was on a National Championship cheer team in high school and went on to win a collegiate National Championship. This is her 4th year dancing for the Warriors, and she feels so humbled and excited to be able to continue this beautiful experience! Hobbies: Nami loves traveling and exploring new places. Fun Fact: Her family lives all around the world - South Africa, Japan and South Korea. Bio: Nami grew up in Kyoto, Japan and moved to the States to pursue her dream of becoming a member of the Warriors Dance Team. 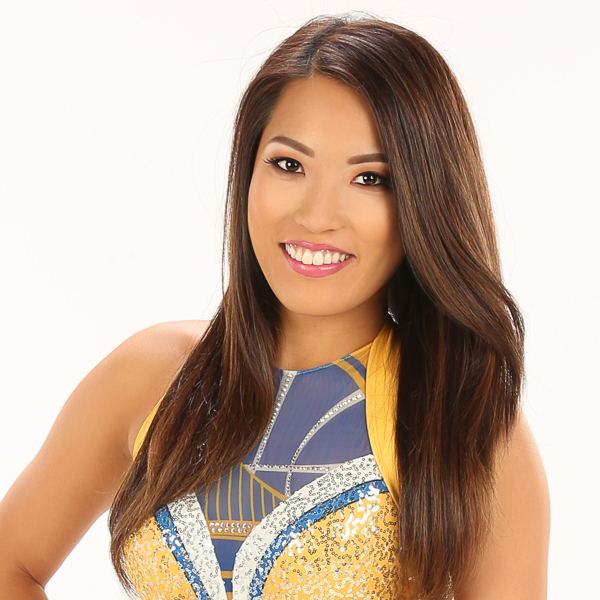 Prior to joining the Warriors Dance Team she was a cheerleader for the American football league, "X-league", and All-Star pro cheer leading team in Japan for six years. Outside of dance, Nami works full time as a Global PR Coordinator for a large e-commerce marketplace where she is extremely passionate about corporate culture and employee engagement. Hobbies: She loves yoga and meditation! Fun Fact: Last year she worked as an English teacher in rural Japan. Quote: “Life’s most persistent and urgent question is, ‘What are you doing for others? ” - Martin Luther King, Jr.
Bio: Nicola began dancing when she was just three years old and grew up training in ballet, jazz, tap, hip hop, and modern. She continued to study dance in college and was on her university dance team for four years. 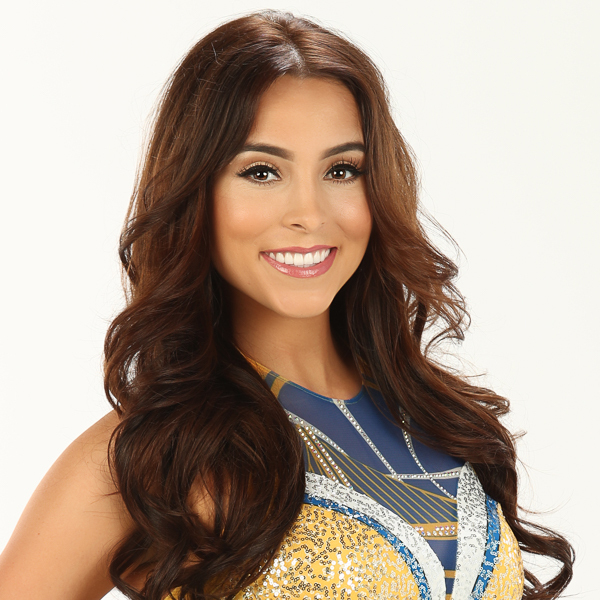 Nicola’s other passion is education and in addition to dancing for the Warriors Dance Team, she is pursuing a Masters in Education and Single Subject Credential in Mathematics. Hobbies: Volunteering in the community, exploring new places, and coffee. Fun Fact: Rachel was recently accepted into law school! 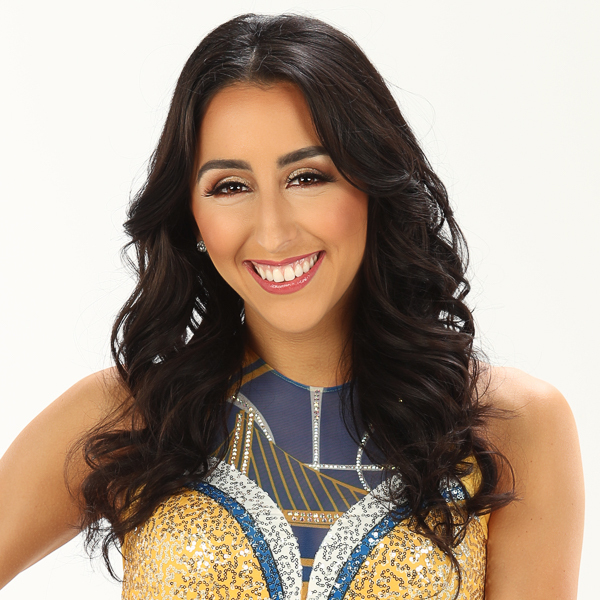 Bio: Rachel was born and raised in the Bay Area and began dancing at age 6. She continued dancing all throughout college and was a member of the Cal Dance Team. Outside of dancing for the Warriors, she currently works as a Litigation Assistant at a local law firm and hopes to pursue a career focused on employment law. 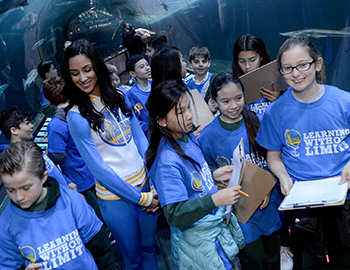 Rachel loves every moment she gets to spend representing the Warriors organization with her teammates and Dubnation! Hobbies: Shannon loves working out and is an avid SoulCycle class attendee. When the weather is nice she likes to find new places to go hiking and exploring the great outdoors. Bio: Shannon was born and raised in Peoria, Arizona where she began dancing at the age of five. While growing up she danced competitively at a studio and trained in styles such as jazz, hip hop, pom, tap, ballet, and contemporary. After high school she moved on to dancing at the collegiate level for the Saint Mary’s Spirit Team for four years and was a captain for two years. In college Shannon was also involved in the Psychology Honor Society "Psi Chi" and was an active participant in the community. Shannon could not be more thrilled to have her dream of dancing for the Warriors come true. She feels so lucky to be sharing her passion for dance with such an incredible organization and alongside the most inspiring teammates. Hobbies: Sierra spends most of her free time in the gym to clear her mind and find inner focus. She also loves to cook and go exploring for fun coffee shops. Fun Fact: She has Tripophobia!!! Aka an aversion to the sight of irregular patterns or clusters of small holes or bumps. Bio: Sierra was born and raised in Nashville, Tennessee where she began dancing at the age of 6. She was studio trained in modern, tap, jazz, hip hop and ballet/pointe. She attended Nashville School of the Arts for high school where she trained in a variety of dance styles from leading artist and groups like Andre Fuentes, Sonya Tayeh, Mia Micheals, The Rockettes, and the Jabbawockeez. 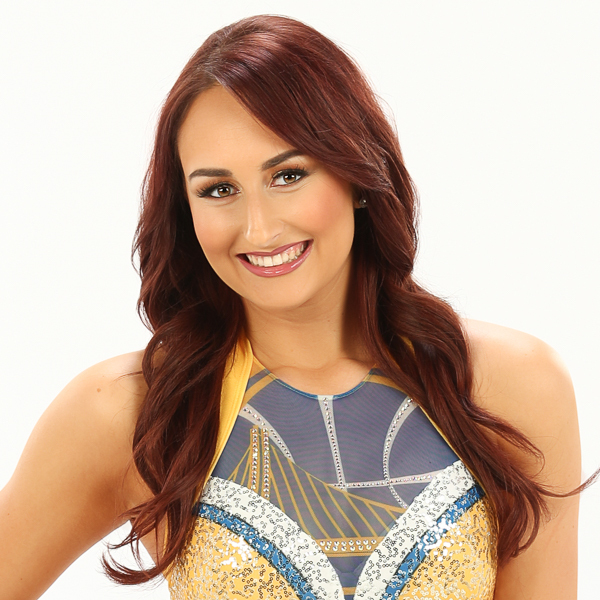 Aside from living out her dream of dancing with the Warriors Dance Team she works as a Data Analyst. In their 31st year as an explosive and valuable entity of the Golden State Warriors' in-game entertainment, the Warriors Dance Team are a magnificent blend of energy, beauty and most of all talent. 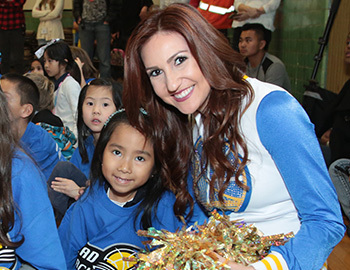 In addition to providing in-game entertainment, the Warriors Dance Team also play a key role as ambassadors for the organization. The dancers are heavily involved in the team’s community outreach programs and have performed throughout the United States and across the globe. The Warriors Dancers are not available for event appearances on scheduled home game nights. Warriors Dancers will wear their official uniforms unless another uniform is requested. 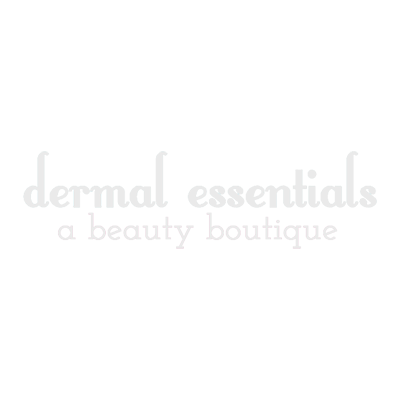 They have a variety of uniforms to fit the needs of your event. At least 4 Warriors Dancers are required for an appearance that will include a dance performance. The client must provide a sound system equipped with a CD player, a room for dancers to warm up in and water. A discounted rate is available for all non-profit organizations, schools and community service events. Payment should be received 10 days prior to the appearance date. If the appearance is located over 20 miles from Oakland, the client will be required to offer travel compensation. Compensation will be based upon the number of additional miles traveled and will be evaluated on a case-by-case basis. Autograph cards and team calendars are available for an additional cost. A set of 50 autograph cards may be purchased for $25. Calendars are $20 each. Any event publicity mentioning an appearance by the Warriors Dancers must be approved by the Golden State Warriors before use. Please call (510) 986-2217 with any questions.